← Hand over = Game over? Every now and then we would hear the name Yoko Ono, often we immediately think of John Lennon, Japan, War is Over, bed peace, art…or perhaps, annoyance, especially if you are a fan of music. Two weeks ago, the BBC uploaded a video of Yoko Ono’s performance in Glastonbury, UK. After watching this video, it reminded me of my visit to Yoko Ono’s exhibition War Is Over! (if you want it) at the Museum of Contemporary Art in Sydney early this year. 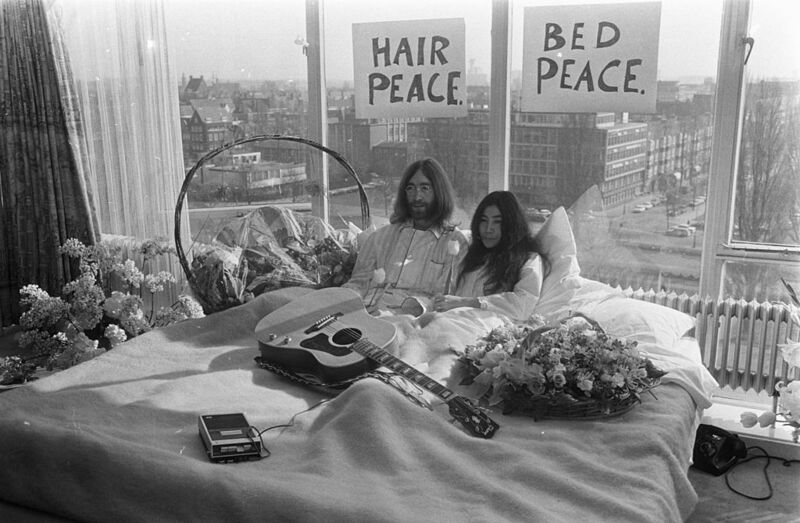 I must say, I am impressed with the advertising strategy which John and Yoko adopted to promote their anti-war campaign back in the 1960s, when they found creative tactics to express their discontentment with the political climate during the Vietnam War. However, I found this exhibition I went to a bit overrated, or perhaps, euphemistically speaking, it may just be my lack of interest in contemporary art as it has always been the case. This is what I thought at the time after attending the exhibition. For months I had forgotten anything about Yoko Ono, until I came across that video (see above) of her performing her song Don’t Worry, Kyoko recently, with over million hits. Once again, the world is being reminded of Yoko Ono. And once again, I am reminded that there is a fine line between genius and madness. The BBC obviously did her a favour by uploading this completely absurd performance on the web. But Don’t Worry, Kyoko*, sorry, I mean, your mother Yoko, you will be soon forgotten again… …until you pull out your next publicity stunt. Here is another performance for your enjoyment. This entry was posted in Listen, Watch. Bookmark the permalink.